The Los Angeles Chargers sacked Lamar Jackson seven times and held on for 23-17 win over the Baltimore Ravens to set up a clash with the New England Patriots next weekend. Mike Badgley kicked five field goals, Melvin Ingram had two sacks and Melvin Gordon scored the Chargers' touchdown. Philip Rivers was 22 of 32 for 160 yards. The Chargers led 23-3 before the Ravens scored two fourth-quarter touchdowns and had a chance to take the lead. Baltimore got the ball at their 34 with 45 seconds left after a punt, but Uchenna Nwosu knocked the ball out of Jackson's hand with the Ravens near midfield and the Chargers recovered. Jackson, who turns 22 today, became the youngest quarterback ever to start in the play-offs. He was held in check for the first three-and-a-half quarters and was booed at one point by fans wanting to see Joe Flacco enter the game. Jackson was 14 of 29 for 194 yards - most of them in the fourth quarter - with two touchdowns and an interception. On Saturday, Dak Prescott guided two fourth-quarter touchdown drives as the Dallas Cowboys rallied to defeat the visiting Seattle Seahawks 24-22 in the NFC wild-card round. Ezekiel Elliott rushed for 137 yards and a touchdown on 26 carries, while chipping in with four catches for 32 yards. Prescott completed 22 of 33 passes for 226 yards and a touchdown and also scored the decisive TD on a one-yard run with 2:08 remaining. It was just the third play-off victory for the Cowboys this century, after they won wild-card round games in 2009 and 2014. The Cowboys' defence limited Seattle's league-leading rushing attack to just 73 yards on 24 carries. Russell Wilson completed 18 of 27 passes for 233 yards and a touchdown. That score was a seven-yarder to JD McKissic with 1:22 left. The ensuing two-point conversion pulled the Seahawks within two. But rookie punter Michael Dickson's onside drop-kick was recovered by the Cowboys and they ran out the clock. 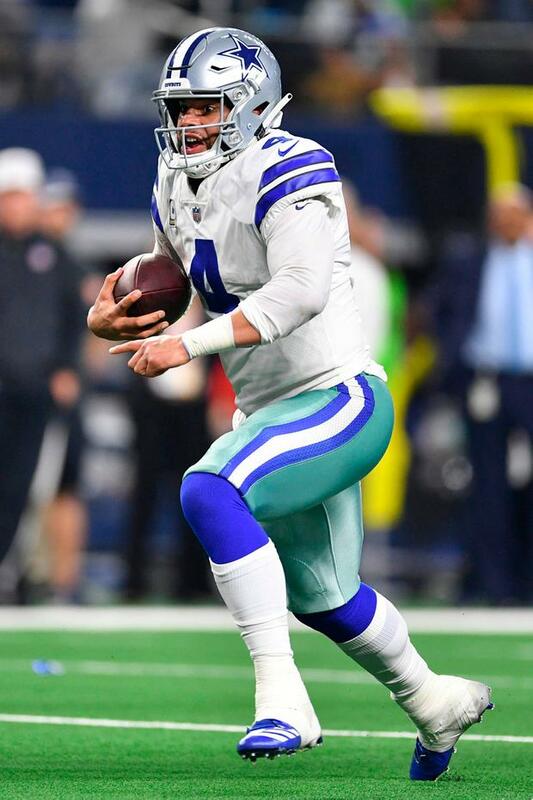 After the Seahawks took the lead late in the third quarter, Prescott guided a nine-play, 67-yard drive that culminated in a one-yard Elliott touchdown run to give Dallas a 17-14 lead. Prescott hit Amari Cooper for a 34-yard completion. The Cowboys all but put the game away with an 11-play, 63-yard drive, capped by Prescott's one-yard score, that took 5:14 off the clock before Seattle's late TD.